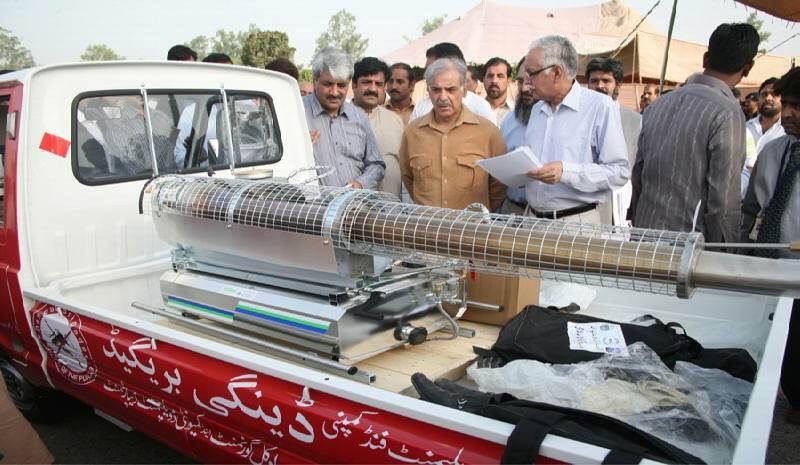 Lahore:Punjab Chief Minister, Muhammad Shahbaz Sharif has said that the government has finalized foolproof arrangements for the eradication and protection against the scourge of dengue and all out resources are being utilized for this purpose. He expressed these views while addressing the ceremony of sending dengue brigade to 14 districts of the province at Minar-e-Pakistan, here today. The Chief Minister handed over the keys of dengue brigade to administrators and TMOs of 14 TMAs besides directing them to remain vigilant against dengue. Talking on the occasion, the Chief Minister said that, initially, dengue brigade are being sent to the districts where dengue cases had been reported last year. He said that the area of operation of dengue brigade would be extended to all districts by 30th June, whereas dengue brigade would also be sent to far-flung districts like Rajanpur and Layyah. The Chief Minister inspected dengue brigade machinery and also sought detailed information from Secretary Local Government Khizer Hayat Gondal in this regard. During a briefing, Secretary Local Government informed that latest foggers, imported from Germany have been installed in the vehicles of dengue brigade which are the best with regard to their standard and efficiency. He said that special training was arranged for dengue brigade personnel in management and professional development department. He further informed that, instead of inducting new staff, the existing staff is being utilized for this purpose. He further informed that the World Bank has provided Local Government Department 500 fogger machines, 1000 spray pumps and 2100 protective uniform kits for the spray staff. He also appreciated the services of Chairman Punjab Municipal Development Fund Company, Dr. Zafar Iqbal Qureshi, Managing Director Amir Nazir and the World Bank in fighting against dengue.